Not to be confused with Pound sterling. E£ or ج.م or L.E. In 1834, a khedival decree was issued, adopting an Egyptian currency based on a bimetallic standard (gold and silver) on the basis of the Maria Theresa thaler, a popular trade coin in the region. The Egyptian pound, known as the geneih, was introduced, replacing the Egyptian piastre (ersh) as the chief unit of currency. The piastre continued to circulate as ​1⁄100 of a pound, with the piastre subdivided into 40 para. In 1885, the para ceased to be issued, and the piastre was divided into tenths (عشر القرش 'oshr el-ersh). These tenths were renamed milliemes (malleem) in 1916. The legal exchange rates were fixed by force of law for important foreign currencies which became acceptable in the settlement of internal transactions. Eventually this led to Egypt using a de facto gold standard between 1885 and 1914, with E£1 = 7.4375 grams pure gold. At the outbreak of World War I, the Egyptian pound was pegged to the British pound sterling at EG£0.975 per GB£1. Egypt remained part of the Sterling Area until 1962, when Egypt devalued slightly and switched to a peg to the United States dollar, at a rate of EG£1 = US$2.3. This peg was changed to 1 pound = 2.55555 dollars in 1973 when the dollar was devalued. The pound was itself devalued in 1978 to a peg of 1 pound = 1.42857 dollars (1 dollar = 0.7 pound). The pound floated in 1989. However, until 2001, the float was tightly managed by the Central Bank of Egypt and foreign exchange controls were in effect. The Central Bank of Egypt voted to end the managed-float regime and allowed the pound to float freely on 3 November 2016; the bank also announced an end to foreign exchange controls that day. The official rate fell twofold. The Egyptian pound was also used in Anglo-Egyptian Sudan between 1899 and 1956, and Cyrenaica when it was under British occupation and later an independent emirate between 1942 and 1951. 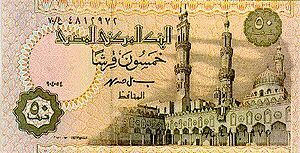 The National Bank of Egypt issued banknotes for the first time on 3 April 1899. The Central Bank of Egypt and the National Bank of Egypt were unified into the Central Bank of Egypt in 1961. Several unofficial popular names are used to refer to different values of Egyptian currency. These include (from the word nickel) nekla (نكلة) [ˈneklæ] for 2 milliemes, ta'rifa (تعريفة) [tæʕˈɾiːfæ] for 5 milliemes, shelen (شلن) [ˈʃelen] (i.e. a shilling) for 5 piastres, bariza (بريزة) [bæˈɾiːzæ] for 10 piastres, and reyal (ريال) [ɾeˈjæːl] ("real") for 20 piastres. Since the piastre and millieme are no longer legal tender, the smallest denomination currently minted being the 25-piastre coin (functioning as one-quarter of one pound), these terms have mostly fallen into disuse and survive as curios. A few have survived to refer to pounds: bariza now refers to a ten-pound note and reyal can be used in reference to a 20-pound note. Different sums of EGP have special nicknames, for example: 1 EGP Bolbol meaning nightingale or Gondi meaning soldier, 1,000 EGP baku (باكو) [ˈbæːku] "pack"; 1,000,000 EGP arnab (أرنب) [ˈʔæɾnæb] "rabbit"; 1,000,000,000 EGP feel (فيل) [fiːl] "elephant". Between 1837 and 1900, copper 1 and 5 para*, silver 10 and 20 para, 1, 5, 10 and 20 piastre, gold 5, 10 and 20 piastre and 1 pound coins were introduced, with gold 50 piastre coins following in 1839. Copper 10 para coins were introduced in 1853, although the silver coin continued to be issued. Copper 10 para coins were again introduced in 1862, followed by copper 4 para and 2​1⁄2 piastre coins in 1863. Gold 25 piastre coins were introduced in 1867. In 1885, a new coinage was introduced consisting of bronze ​1⁄4, ​1⁄2, 1, 2 and 5 millieme, silver 1, 2, 5, 10 and 20 piastre coins. The gold coinage practically ceased, with only small numbers of 5 and 10 piastre coins issued. In 1916 and 1917, a new base metal coinage was introduced consisting of bronze ​1⁄2 millieme and holed, cupro-nickel 1, 2, 5 and 10 millieme coins. Silver 2, 5, 10 and 20 piastre coins continued to be issued, and a gold 1 pound coin was reintroduced. Between 1922 and 1923, the gold coinage was extended to include 20 and 50 piastre and 1 and 5 pound coins. In 1924, bronze replaced cupro-nickel in the 1 millieme coin and the holes were removed from the other cupro-nickel coins. In 1938, bronze 5 and 10 millieme coins were introduced, followed in 1944 by silver, hexagonal 2 piastre coins. Between 1954 and 1956, a new coinage was introduced, consisting of aluminium-bronze 1, 5 and 10 millieme and silver 5, 10 and 20 piastre coins, with the size of the silver coinage significantly reduced. An aluminium-bronze 2 millieme coin was introduced in 1962. In 1967 the silver coinage was abandoned and cupro-nickel 5 and 10 piastre coins were introduced. Aluminium replaced aluminium-bronze in the 1, 5 and 10 millieme coins in 1972, followed by brass in the 5 and 10 millieme coins in 1973. Aluminium-bronze 2 piastre and cupro-nickel 20 piastre coins were introduced in 1980, followed by aluminium-bronze 1 and 5 piastre coins in 1984. In 1992, brass 5 and 10 piastre coins were introduced, followed by holed, cupro-nickel 25 piastre coins in 1993. The size of 5 piastre coins was reduced in 2004, 10 and 25 piastre coins - in 2008. On June 1, 2006, 50 piastre and 1 pound coins dated 2005 were introduced, and its equivalent banknotes were phased out and completely disappeared from circulation in 2010. The coins bear the face of Cleopatra VII and Tutankhamun's mask, and the 1 pound coin is bimetallic. The size and composition of 50 piastre coins was reduced in 2007. * 1 para = ​1⁄40 piastre. ** Not in circulation as of 2008. *** As to commemorate the branching of the Suez canal, the obverse had the Arabic phrase, قناة السويس الجديدة "New Suez Canal". In 1899, the National Bank of Egypt introduced notes in denominations of 50 piastres, £1, £5, £10, £50 and £100 were introduced. Between 1916 and 1917, 25 piastre notes were added, together with government currency notes for 5 and 10 piastres. Issued intermittently, the 5 and 10 piastres are today produced by the Ministry of Finance. 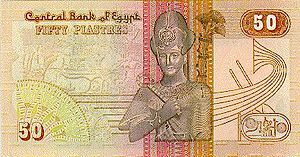 In 1961, the Central Bank of Egypt took over from the National Bank and issued notes in denominations of 25 and 50 piastres, £1, £5, £10 and £20 notes were introduced in 1976, followed by £100 in 1978, £50 in 1993 and £200 in 2007. 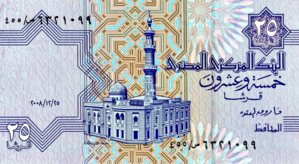 All Egyptian banknotes are bilingual, with Arabic texts and Eastern Arabic numerals on the obverse, and English texts and Western Arabic numerals on the reverse. Obverse designs tend to feature an Islamic building with reverse designs featuring Ancient Egyptian motifs (buildings, statues and inscriptions). During December 2006, it was mentioned in articles in Al Ahram and Al Akhbar newspapers that there were plans to introduce £200 and £500 notes. As of 2015, there are £200 notes circulating but there are still no plans for making £500 notes. Starting from 2011 the 25, 50 piastres and £1 banknotes have been phased out and replaced by more extensive use of coins. As of June 2016 the National Bank of Egypt reintroduced the £1 banknote into circulation as well as the 25 and 50 piastres notes in response to a shortage of small change. ^ Cuhaj, George S., ed. (2009). Standard Catalog of World Paper Money Specialized Issues (11 ed.). Krause. p. 1070. ISBN 978-1-4402-0450-0. ^ Feteha, Ahmed; Shahine, Alaa (3 November 2016). "Egypt Free Floats Pound, Raises Lending Rates to Spur Economy". Bloomberg. Retrieved 3 November 2016. ^ "CBE not to impose restrictions on foreign currency exchange". Egypt Independent. 3 November 2016. Retrieved 3 November 2016. ^ "Wayback Machine". 10 December 2004. Archived from the original on 10 December 2004. Retrieved 15 October 2017. ^ "Nach Thund". Nachthund.biz. Archived from the original on 27 September 2007. Retrieved 15 October 2017. ^ ""المركزى": تراجع قيمة الجنيه لن يدفعنا لطرح ورقة نقدية من فئة 500 - اليوم السابع". Youm7.com. 15 September 2012. Retrieved 15 October 2017. Wikimedia Commons has media related to Money of Egypt. This page was last edited on 13 April 2019, at 02:31 (UTC).